Janet Pierce was born in Edinburgh, Scotland in 1947. She studied at Edinburgh College of Art and Moray House, Edinburgh from 1965-1969 and had her first solo exhibition in the Everhart Museum, Scranton, Pennysylvania in 1973. After four years in America she moved to Ireland where she has since lived and worked, while keeping in touch with her native Scotland. Pierce’s first Solo exhibition in Ireland was in the Arts Council Gallery, Belfast in 1977 since when she has continued to exhibit in Solo and Group exhibitions in Ireland, U.K,India and in the U.S.
Pierce was Regional Arts Officer, Fermanagh District Council from 1982-86 and in the following years was a guest artist at the Museum of Modern Art, Edinburgh; guest lecturer at Edinburgh University; Arts Officer, Scottish Arts Council, Edinburgh and part-time lecturer in Fine Art, Painting, NCAD Dublin and at DLCADT, Dunlaoighaire before becoming Education Officer at the Douglas Hyde Gallery, Dublin. 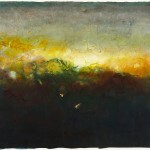 Pierce became a full-time painter in 1995 and in 1998-1999 she collaborated with the traditional singers, Maighread and Triona NÃ­ Dhomhnaill, in their CD ‘Idir an DÃ¡ Sholas’ (between the two lights), a collaboration which helped Pierce realise her deep connection with landscape. Pierce’s work, in the past, has been informed by emotional landscapes whether it be the Scottish Highlands or the rugged seascapes of Donegal. However, following an intensely close involvement with India over the last eight years, Pierce’s work took a different direction. It finally came about as a result of highly mystical experience at the source of the holy river Ganges, high up in the Himalyas, where she spent a month meditating and painting in February 2006. The word OM, from the ancient Sanskrit alphabet, is the sound of the universe or the Source or God, and reflect’s Pierce’s desire to return to that Sacred Space within, through meditation. Using gold leaf from Old Dehli, these new abstract works on paper has resulted in an intensification of earlier considerations, her hunger for transcendence realized through the contemplation of landscape and of the cosmos. Irish Ambassador’s Residency, New Delhi, India. Smurfit Group, New York, U.S.A.
Virginia Center for the Creative Arts, U.S.A. This entry was posted in Artist Profile and tagged AIB, Bank of Ireland, contemporary painters, Crawford Gallery, Galway Arts Festival, Hamilton Gallery Sligo, Irish Museum of Contemporary Art, Kellys Hotel, Member of Aosdana, Office of Public Works, Ormeau Baths Gallery, Pigyard Gallery, RHA Exhibition, Royal Ulster Academy, Sligo, Taylor Gallery, The Butler Gallery Kilkenny, The Hunt Museum Limerick, The Model, Triskel Arts Centre, Vanguard Gallery, Wexford Opera Festival. Bookmark the permalink.